We’re often talking to interesting people attempting to do interesting things. Last week I was in Manchester at AGMA’s invitation to meet the heads of planning. They are busy thinking through what devolution means and how to prepare for a Mayor (great song title that). They helped me to see that our framework can play a useful role in bringing a city region together. The PQF operates at a very fine level of detail to help people understand how they are performing and (where necessary) work out which particular areas are worth digging into. All we need to add is a public cut of the data which can act as a transparent performance snapshot. And, which is exciting for me, when they get going on the survey part of the framework this performance guarantee will *not* be based on some silly 8-week target or indeed solely speed-based measures. It will be based on how people think they have been treated. We use percentages all the time in planning. It’s in the DNA – percentage compliance with a national indicator is what makes many planners get up in the morning. But they are useless at understanding what is going on. 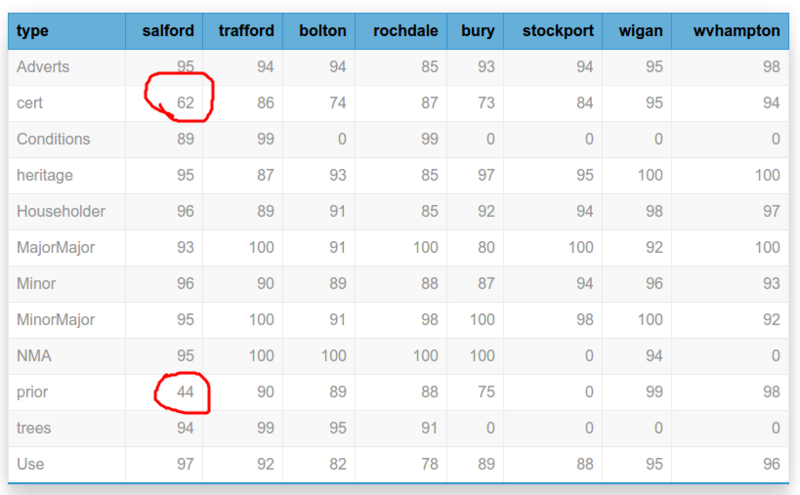 Take this output from a report I was looking at today, pretending I was from Salford. It’s section 2a – a breakdown of approval rates by category of development.